I want to join the circus! I’m sorry to be the one to say it, but that’s such a cliché. No it’s not, I really mean it! That’s an interesting ambition, but I don’t think any circus would be looking for your kind of talent. What a mean thing to say! Why are you trying to discourage me? I think it’s wonderful that you can dance by waving your paws in the air, but generally a circus is looking for acrobats and jugglers. Clowns. Trapeze artists. I’m an artist. I can jump. I can walk on a railing. I’ve got circus talent. I’m sure you do, honey. I’m sorry, I just don’t know what kind of circus would be looking for a cat. A cat circus, of course!!!!! 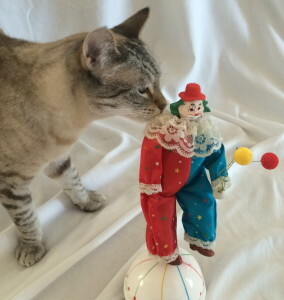 A cat circus? I’m sure that doesn’t even exist. Yes it does!!!!!!!!!! There is a real cat circus, The Amazing Acro-Cats. They’re FAMOUS!!!!! They do everything! They perform, they play music, they astonish everyone! With just a couple of humans to help out. That’s weirdly awesome. I can’t believe someone actually got a bunch of cats to cooperate in a circus act. The cats don’t have to cooperate. The humans do.